TEIN Racing springs are linear rate springs which were developed specifically for use in motorsports where weight is a key factor. A unique coil design was utilized to reduce the amount of material used. This allows for increased spring stroke, and a lighter weight in comparison to TEIN Standard Springs. Design features include a flat top and bottom design for use with coilovers, and green finish. Helper springs and related hardware are available in 58mm, 65mm, and 70mm I.D. Racing springs are recommended for competition and motorsports use. • Straight spring designs in 58mm, 65mm, and 70mm inner diameter. • Spring lengths include 100mm, 115mm, 125mm, 150mm, 175mm, 200mm and 250mm. 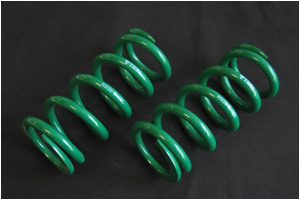 • High Load spring also available in 58mm, 65mm, and 70mm I.D. Please refer to TYPE Gr.N (F.R.S. Spec / Standard Spec) pages for more information.